In modern central monitoring console units, the entire information of different patients from different bedside monitors are collected and displayed. With this information the operator in the central monitoring console can give guidelines to the physicians and nurses so that the patients with abnormalities in various physical parameters can be given care separately. So, all the measured physical parameters are routed from each on bedside monitors to the central nurse's console. The CMC consists of an array of multi-channel oscilloscopes, digital tachometers etc. 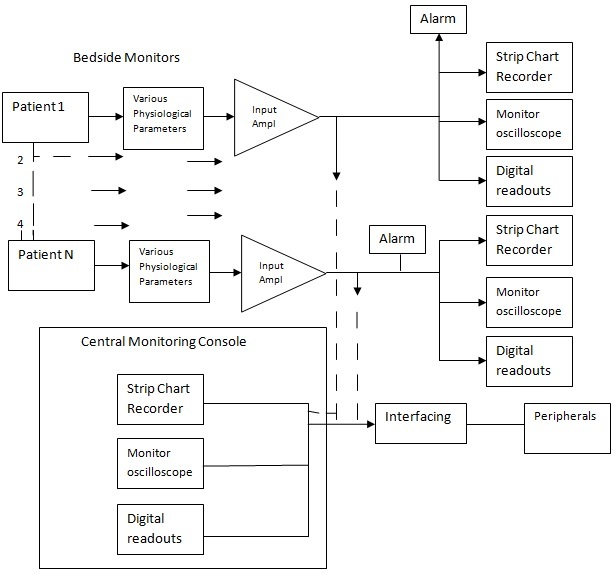 The typical block diagram of CMC in ICU is shown below. Here the electrodes measure different physiological parameters from different patients. They are amplified by high gain op-amps and are locally displayed on bedside monitors. Also digital readouts and paper readouts are provided. Also local alarms are provided to alert the staff if the condition of patients becomes abnormal. The various parameters from each BSM is transmitted to central monitoring console by suitable transmission paths. The staff at the central monitoring console can continuously monitor the patients and the number of staffs at the bedside monitors can be reduced. The data can also be stored in a digital computer.